I already started to experience the business class treatment even before boarding the plane. At NAIA I was given entry to the lounge that had unlimited brewed coffee, sandwiches, mami, siopao, fruit bowls... etc. Boy I was so glad because I didn't have a decent breakfast that morning. And during boarding I didn't have to queue. When the ground steward noticed that my ticket's business class he immediately ushered me past the long line of passengers announcing not so discreetly, 'Padaanin nyo si ma'am, business class yan!' Well that inspired me to don my big sunglasses, fling my shoulder-length hair (kahit di sya sumunod sa galaw ko) and strut my way to the plane. 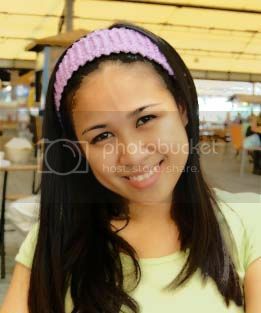 I must have looked like an unknown or worse a "laos" starlet (hahahaha!). Everytime I fly, I am heady with joy. Oh it doesn't have to be business class. I can survive 16 hours of flight in a cramped economy section. Well it's the flying per se. That it can either mean I am going home to my family (to spend my pounds, hahaha) or that I am going to Manila, Japan, UK, Timbuktu or to some other place where I can plant a flag with bold letters that "Georgia was here". Kapila naman tika nakit-an nga ga-impake day oi, I remember this is my Mama's comment everytime she sees me preparing for a flight. Oh I am not a super frequent traveller; my passport still has a lot of blank pages. But the fact that I have been to places (some for free!) miles away from my humble little island of birth, Cebu, is enough for me to bow my head in gratitude. Again, I feel so blessed. Great to see your blogs again. Waaahhh gusto ko ng bumili ng laptop. Nice color by the way. And the business class is really divine, i know what you were talking about. ate george!!! good to know you're back online! sayang di na tayo nagabot sa pinas. huhu. and whoa astig may laptop agad! at sony vaio pa! sosyal! at pink pa! wow wow wow!!! joane! it's good that you're blogging again. oo ganyan talaga pag deadly shoes. libre? heller meron naman manglilibre sa yo from SG.